Recently, I've had the good fortune of meeting some folks who have the good fortune to live ON the water in Seattle. I had no idea before moving here that water living is such a Thing - and apparently there used to be way more floating homes before the city cracked down on regulations. After mentioning my interest in them to Gabi Campanario, he generously hit up some of his acquaintances with interesting watery living situations and arranged some visits. A brief context: The floating homes started as a scrappy working class housing necessity (built by sawmill workers during the timber boom), now it's a gentrifier phenomenon – a place on the lake is now easily over $1 million. The houses float on big old timber logs, some scavenged from the mills over 100 years ago. 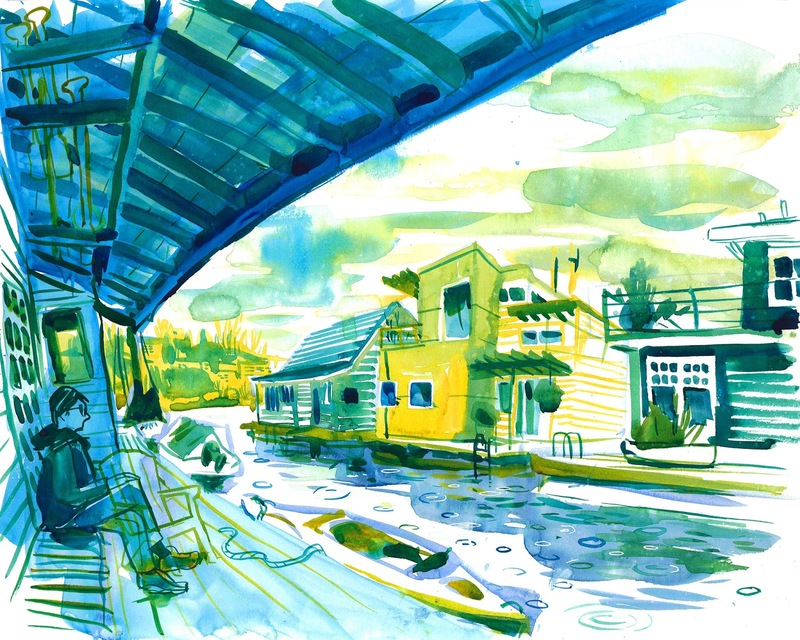 Actual houseboats (live-aboards) require a hard-to-get permit & you have to find/rent moorage. There are pros and cons to each! Being able to easily move your home around seems pretty great, but you sacrifice certain things, like having convenient access to toilets, running water, internet, etc. The floating homes & live-aboard boats are probably my favorite thing about this city so far, and seem culturally unique to Seattle. Getting to explore them makes me feel happy that I moved here. 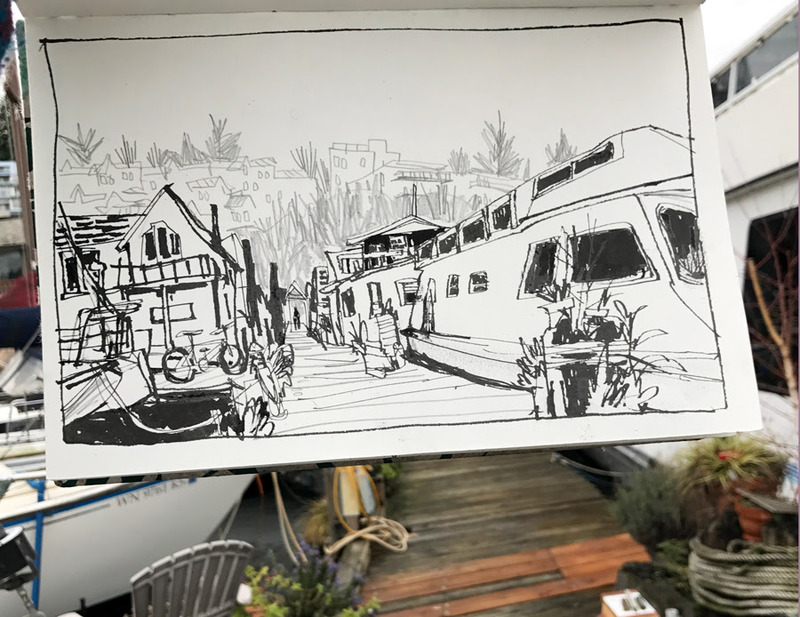 I'm also grateful for sketching, which has led me to meet these people who are gracious enough to invite me onto their docks (which aren't open to the public) and into their homes. This floating home is in Eastlake, just a 10 minute walk from my apartment. It's occupied by a renter who didn't want to be named. His house apparently used to be a brothel! The kitchen, with the skylight, was my favorite part of the interior. the view from A's patio, with fellow sketcher Gabi Campanario doing his thing on the left. Being able to walk out the door & jump in your kayak and paddle out would be so convenient! It was raining during the visit but I took advantage of the covered area make a quick watercolor before my hands froze. Ann is a Seattle native (I think - she's lived here for decades, at the least) who has lived in her lovely floating home for decades & was also introduced to me by Gabi. We weren't able to go inside her house, but there was plenty to explore on the dock and patio. This one is on the other side of Lake Union in Westlake. I love how the docks themselves feel very lived in - potted plants are everywhere & there are plenty of chairs available to lounge in. Ann even swims off her dock in the summer! Apparently Lake Union is clean enough these days. Our host remarked on the new boxy home that recently moved in a few docks down. Apparently these new "luxury" houses are assembled elsewhere and floated in to the lots! So there isn't that connection of the materials to the land that the older homes have, and a lot of charm is lost. Seattle should recognize the value of its history in these floating homes and do something to preserve the aesthetic before it's lost. Ann has a direct view of the most famous floating home - the one used in Sleepless in Seattle (the one on the end of the opposing dock with the bench on the end). Ann and her neighbors own their dock as a co-op, so parts of it are rented out for moorage to actual houseboats. I met Jack at a party at the Center for Wooden Boats, and he invited my partner & I over for dinner to his live-aboard sailboat! 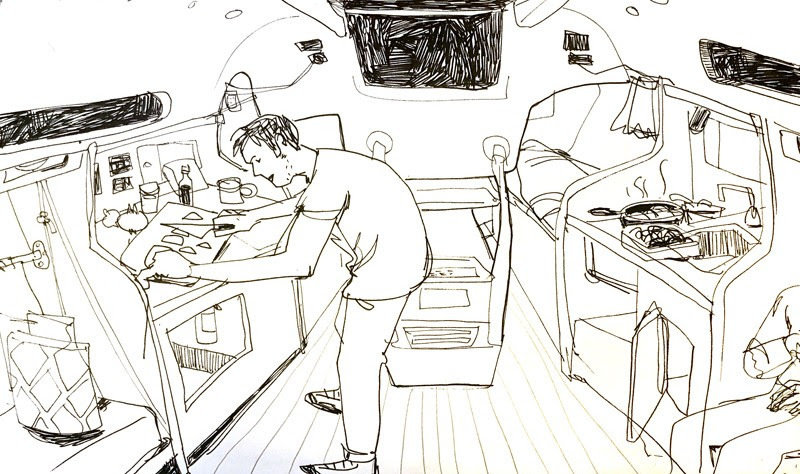 He whipped up a hearty stir-fry for us in his boat's super minimal kitchen. 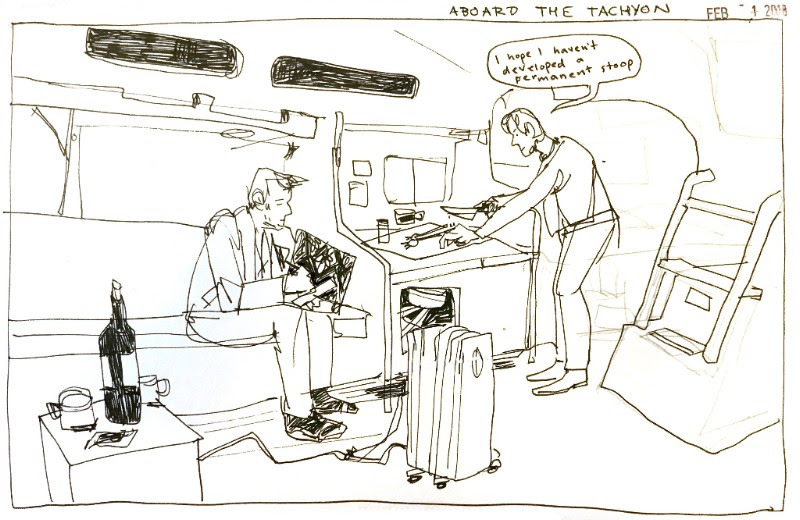 Jack lives aboard the Tachyon (n. a hypothetical particle that always moves faster than light), a 42 footer sailboat moored in the Shilshole Bay Marina, on the Puget Sound (I'm super jealous of the mountain views he gets from the dock). His parents were also boat people back in the day, and though he's a Pacific Northwest native, he's not lived in Seattle much longer than us. The Shilshole Marina is quite sterile compared to the floating home docks - no potted plants, keyed gates on the entrances - and it was hard to tell how many of the other boats were being lived on. I definitely want to come back to sketch the surroundings here, it was a very cold and rainy night when we visited. Although he likes to cook, Jack is definitely too tall of a dude to do this too often (he was really stooping over the whole time) – mostly he spends his free time at tea houses on land where there is wifi and comfortable desks to work. It was roomier down in the cabin than I would have expected. Larger than most studio apts in NYC, though the ceilings are quite low. 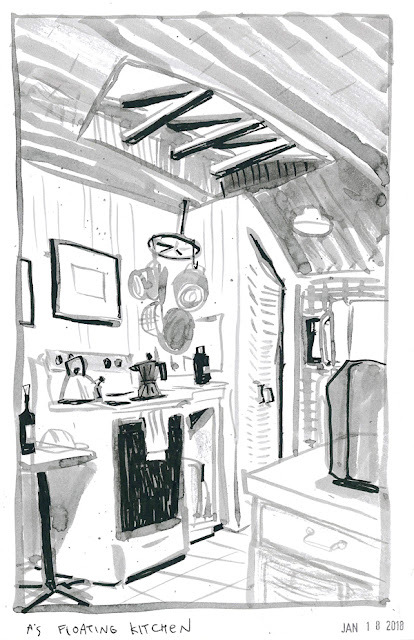 The space is really challenging to sketch, especially because of the curved walls and ceilings. Fantastic reportage of Seattle's most famous "sleepless" neighborhood!